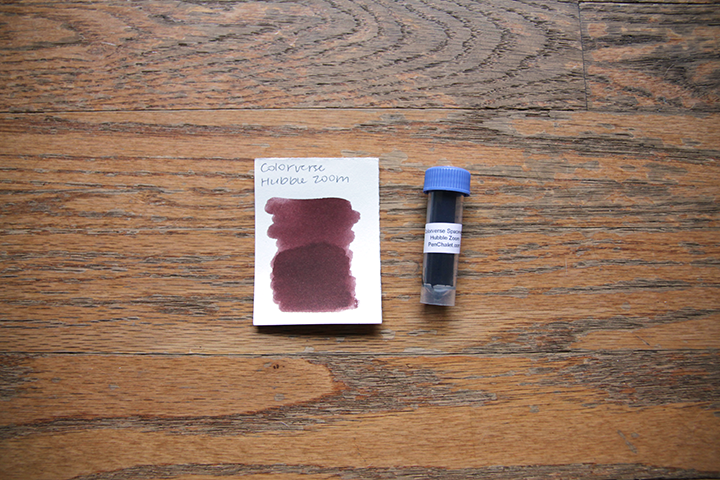 We're taking a look at another Colorverse ink today! 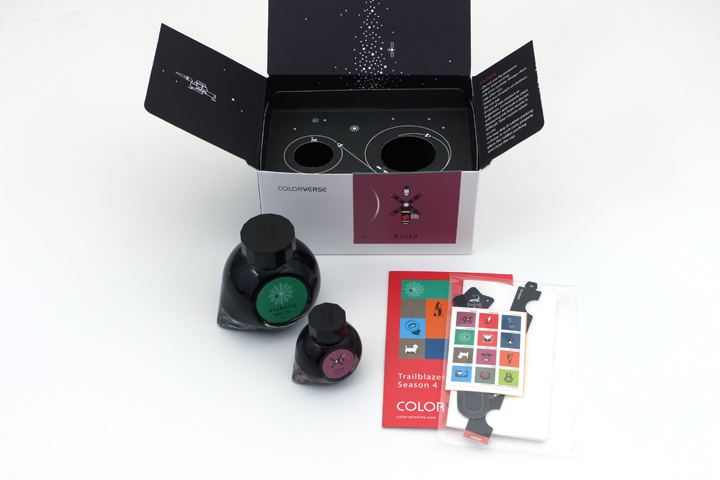 Colorverse inks normally come in two bottle sets, one with 65ml and one with 15ml. Sometimes it's two different colors per box; other times, it's the same color. The bottles are quite pretty and interesting: the caps are glossy black and faceted, while the glass bottle is shaped a bit like a sideways water drop. There's a colored sticker on the front with the name of the ink and the icon associated with that ink that they use across all packaging. I think in sum it's very much a collector's item. It reminds me a lot of something like Moleskine, which gives you all these little pamphlets to tell you all about how good and special the notebook is. For me, I don't need anything interesting to entice me into making a purchase. I just want an ink that looks good and works! 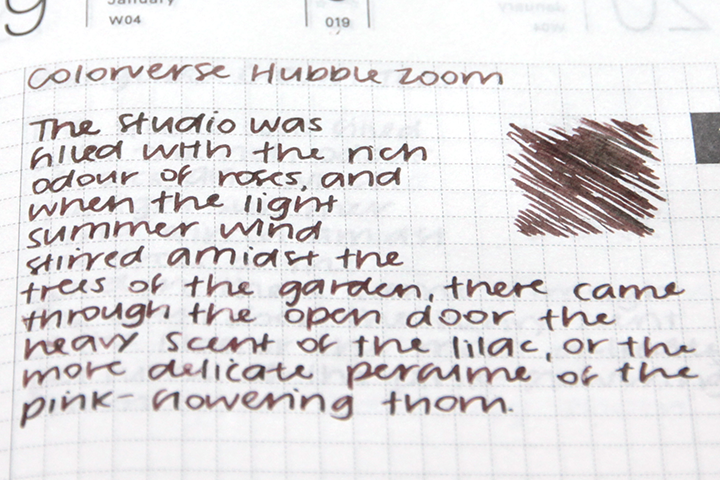 Colorverse Hubble Zoom is an interesting brown-purple. For information on how I do my reviews, please visit my policy page. The ink breaks up into an orange color once it gets in contact with water. It's definitely not waterproof, but there's enough of that orange color leftover that you'll be able to read what got wet. Hubble Zoom is quick to dry: it was almost done by the 30 second mark and completely dry at the 45 second mark. It's quite a flat ink; there isn't much in terms of shading. It also has no sheen. Here, I compare the ink to a couple more that I have. De Atramentis Pisces is probably the closest. 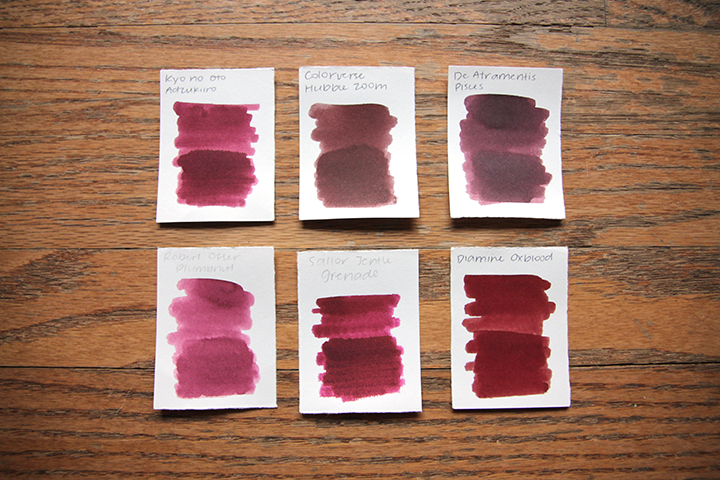 All my other inks are too red, purple, or pink. I had Hubble Zoom in my TWSBI Diamond 580 RB, my lone modern medium nib. 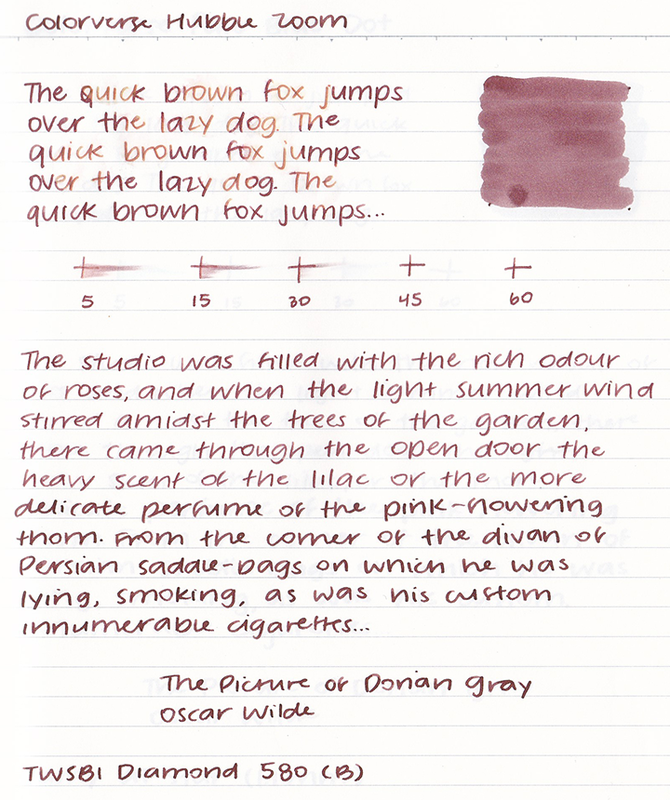 I've adjusted it so it writes wetter to my preference, but Hubble Zoom flowed well and without issue even after letting my pen sit for a week or two (which is becoming more often as of late). It's definitely an ink that doesn't require a ton of maintenance. Overall, I think Hubble Zoom is an interesting color, and I'm glad I tried it out. I don't think it's a color I would normally reach for, but it's good to get out of your comfort zone sometimes! Like I said in my Black Hole review, I probably wouldn't purchase full bottles of Colorverse inks. It's out of my budget and doesn't seem like a good deal to me, though I will admit I find their aesthetic cute and really interesting! I purchased this sample from Pen Chalet. Connie is a Californian of Taiwanese descent, born and raised in the South Bay. They're just a regular person who loves fountain pens, stationery, and writing far too many words about those things.